According to the National Marine Fisheries Service, the proportion of Maine workers employed in commercial fishing industries is more than ten times the national percentage. Nowhere is this more true than in eastern Maine. Hancock and Washington counties employ more commercial fishermen and account for the majority of clams and lobsters landed in the state. Many of these same fishermen also harvest eels, alewives, smelt, crabs, herring, halibut, shrimp, scallops, urchins, worms, whelks, and seaweed. Sea farmers raise Atlantic salmon, mussels, and oysters; and fish hatcheries in the region produce endangered sea-run salmon for restoration in Maine rivers. More information and resources on Downeast fisheries now will be added here in the coming months. In the meantime, visit the Department of Marine Resources to learn more about Maine’s commercial fisheries and aquaculture, and check out the Maine Seafood Guide. Remember, fishing is hard, serious work. 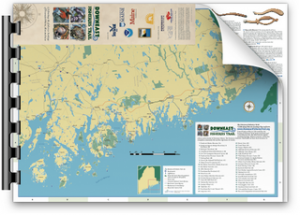 Many sites on the Downeast Fisheries Trail are located on or near working waterfronts. These waterfronts provide access to and from the water, and are valuable locations for Maine’s fishing industry and the communities it supports. Please respect workers and their space. To learn more, visit www.accessingthemainecoast.com.